So you're buying a new home or remodeling an old one? Have you thought about installing central air conditioning or a new HVAC system? 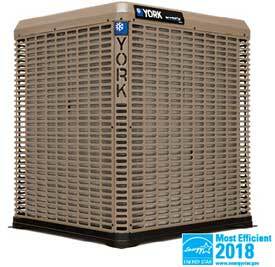 Let YORK® quality make a difference in your central heating and cooling system! A new home comfort system gives you the latest, energy-saving technology that helps reduce your utility bills. And with proper installation by your YORK® Contractor, you can also enjoy more consistent temperature control and improved indoor air quality. Here's why. Environmentally Friendly - All new YORK® brand cooling systems use U.S. EPA-approved refrigerant that reduces environmental impact and saves energy. Superior Comfort - A properly installed system lets you enjoy more consistent temperatures and humidity control - and lets you enjoy saving energy, too! Better Indoor Air Quality - YORK® offers an array of choices designed to ventilate stale indoor air, zap airborne germs, trap airborne particles and control humidity to mold and mildew growth. A central air conditioning system also distributes air through ductwork to provide cooling, ventilation, heating (if using a heat pump or gas furnace) and humidity control. Central air conditioners can either be split systems or packaged units. A split system air conditioner comes in two parts: an indoor unit that integrates with an air handler or a furnace, and an outdoor unit with a compressor and condenser coil. When these components are properly matched, the system runs very efficiently. A central heating system - often called a "forced air system" - sends air into your home through ductwork installed above ceilings or in walls. The advantage is that the airstream can be filtered and humidified to make your home more comfortable. Economically, today's gas furnace technology is so efficient that up to 98% of the fuel in our most efficient furnace is turned into usable heat. Today's "tight" building construction traps pollutants indoors. That's why, according to the environmental Protection Agency (EPA), indoor air in "homes and other buildings can be more seriously polluted than the outdoor air." Most people spend approximately 90% of their time indoors, so the health risks from pollutants inside are often greater than outside! Poor indoor air quality can cause dizziness and headaches and complicate allergies and asthma. Air cleaners and ventilators can introduce fresh outside air without wasting energy. Using central humidifying or dehumidifying equipment can also help improve indoor air quality. When first invented, thermostats merely turned heating and cooling equipment on or off at a certain temperature. Today's thermostats are more intelligent. In addition to basic temperature control, they can be programmed to fit your family's schedule and communicate with equipment to ensure proper function. Pantano Cooling & Heating can advise you on a system that will improve the comfort and energy efficiency of your home.